Room furniture was nice, bed comfortable and shower good. We sound asleep in our bed thats the reason we are late in our activities for the day my child says its comfy. Breakfast were very good. Our room was very spacious and comfortable. The ambience of the hotel was great. The Wi-Fi was strong and at every point of the property. The employees were extremely helpful. Its about average. Just a place to return to for sleep, as we spent most days out. I also like the free shuttle bus to the MTR station and back to the hotel. Was good. There is also 1, 7/11 shop right in front the hotel. the room is very clean and new. Staff is very helpful. It provides shuttle buses to closest mrt and also to shopping center. The bed was comfortable. The staff were friendly. Breakfast was ok. i would have preferred to make the eggs myself. We had running hot water. On the lower floor which was good. Room is spacious and bed is comfy. Accommodating staff. 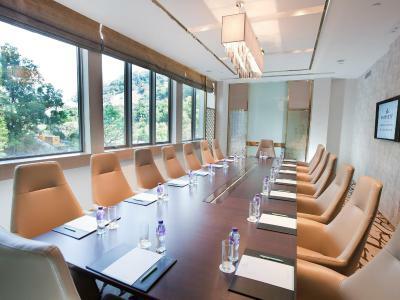 Dorsett Tsuen Wan, Hong Kong This rating is a reflection of how the property compares to the industry standard when it comes to price, facilities and services available. It's based on a self-evaluation by the property. Use this rating to help choose your stay! 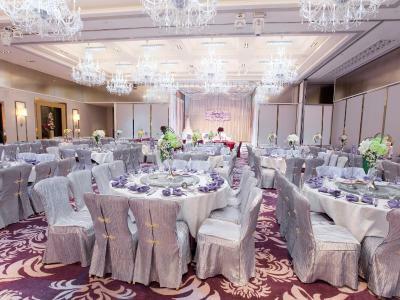 Located in the bustling Tsuen Wan district, Dorsett Tsuen Wan is a 30-minute drive from Hong Kong International Airport, AsiaWorld-Expo and Hong Kong Disneyland. 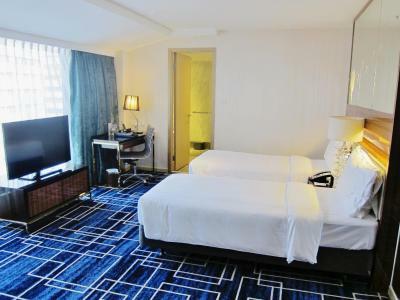 Well-appointed rooms here will provide you with free WiFi, unlimited 4G Mobile Internet Access & IDD (including Brunei Darussalam, Canada, China, India, Malaysia, Singapore, South Korea, Thailand & USA) and a 40-inch flat-screen TV. 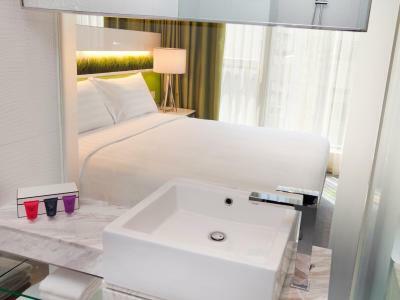 Featuring a shower, private bathrooms also come with a hairdryer and large windows overlooking the city. Nonsmoking rooms are available. 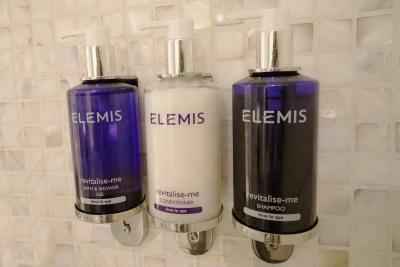 Guests can recharge with a therapeutic spa treatment at the spa center or work out at the fitness center. A safety deposit box, currency exchange and luggage storage can be requested at the 24-hour front desk. Babysitting services are provided as well. 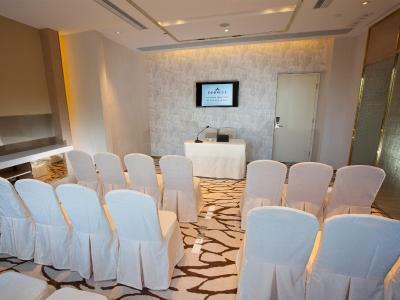 A fully equipped gym, meeting Rooms and ballroom are provided. Kwai Chung is a great choice for travelers interested in local food, street food and convenient public transportation. 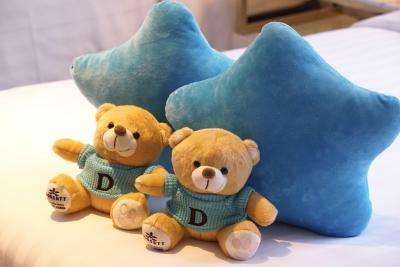 When would you like to stay at Dorsett Tsuen Wan, Hong Kong? This room has floor-to-ceiling windows which features garden views. It also comes with an individual bathroom fitted with a bathtub or rain shower. 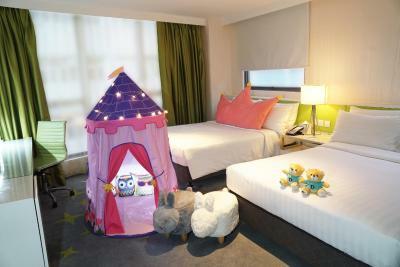 Located in both smoking and nonsmoking area, the room is on 3rd to 20th floor. The room features complimentary WiFi, unlimited 4G Mobile Internet Access & IDD (including China, USA, Singapore, Canada, Korea, Thailand, UK & Australia). This room has floor-to-ceiling windows which features city views. It also comes with a 40-inch flat-screen TV and an individual bathroom fitted with a bathtub or rain shower. 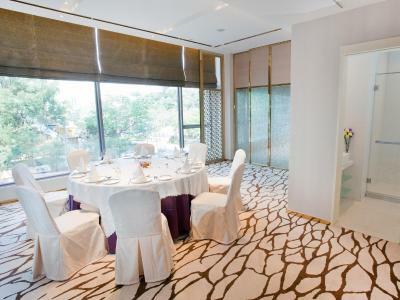 Located in both smoking and nonsmoking area, the room is on 3rd to 20th floor. Please note that room rate includes occupancy for 2. The 3rd person needs to stay in an extra bed for an additional fee. 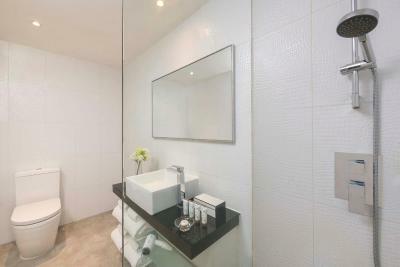 Boasting mountain or city views, this room is fitted with an private bathroom with bathtub or rain shower. 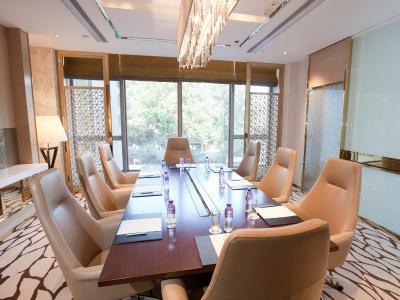 Located in nonsmoking area, the room is on 5th and 19th to 22nd floors. 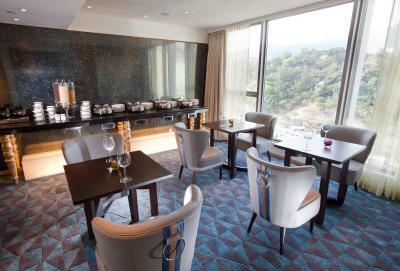 The room offers light breakfasts at Club Lounge on the 22th floor. 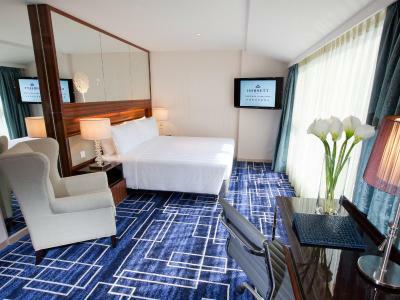 Boasting city views, this room comes with a private bathroom with shower. 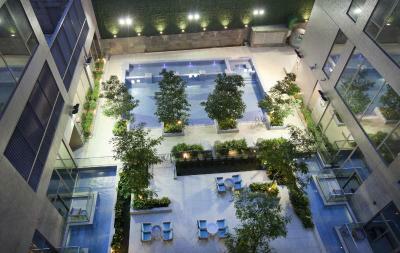 Located in both smoking and nonsmoking area, the room is on 2nd and 6th to 20th floor. Complimentary WiFi and unlimited 4G Mobile Internet Access & IDD (including China, USA, Singapore, Canada, Korea, Thailand, UK & Australia) are also available. Please note that room rate includes occupancy for 4. 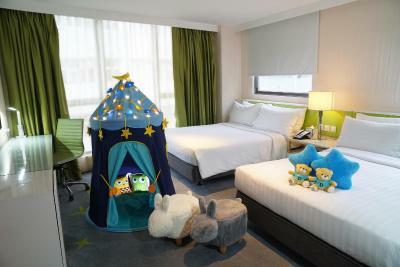 The 5th and 6th occupancy will be offered an extra bed. This twin/double room features a cable TV, bathrobe and mini-bar. For guests wishing to use the complimentary airport pick-up service, please note that the arrival flight number & time is required upon reservation. Each guest can check-in a maximum of 1 piece of baggage (Dimension: 28 in x 17 in x 17 in) for the airport shuttle service. The shuttle is available only between 10:30 - 23:30 hrs. Please approach Airport Registration Counter at Arrival Hall A, Counter A14 after clearing the customs. Complimentary breakfast and evening drinks are served at the Dorsett Lounge. This family room features a bathrobe, air conditioning and mini-bar. 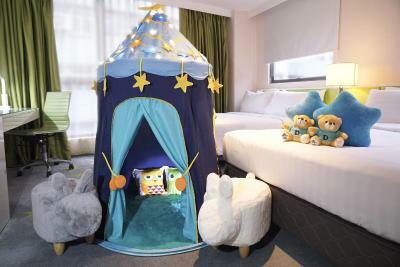 The room comes with a kid tent and deluxe kid's amenity set. This triple room features a flat-screen TV, mini-bar and electric kettle. 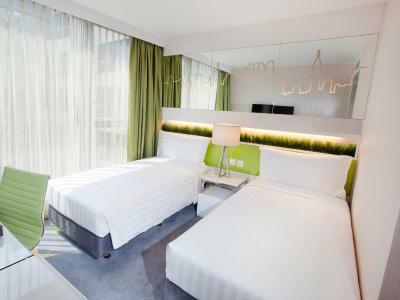 This triple room has a mini-bar, garden view and air conditioning. 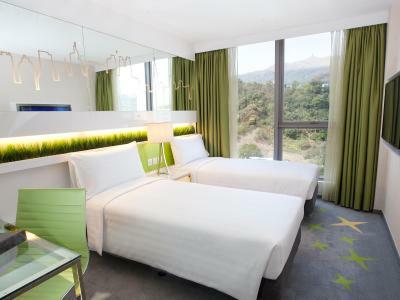 Dorsett Tsuen Wan, Hong Kong features 547 well-appointed guest rooms and Suites including free Wi-Fi Internet access, Unlimited 3G Mobile Internet Access & IDD; It takes only 30 minutes' drive to the Airport & AsiaWorld-Expo, while 5 minutes' walk to the MTR Tai Wo Hau Station. 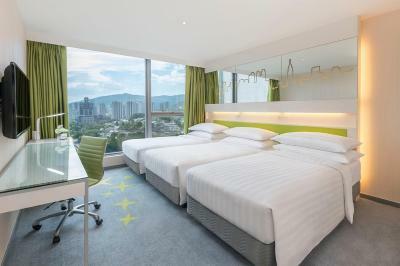 Complimentary in-town shuttle bus service to/from hotel and MTR Tsuen Wan Station, Outdoor Swimming Pool,fully equipped GYM. 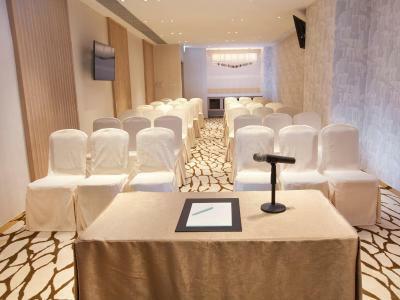 SPA, Meeting Rooms & Ballroom will be provided. 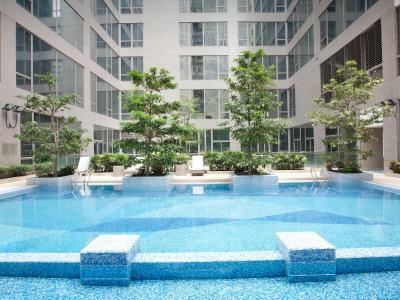 House Rules Dorsett Tsuen Wan, Hong Kong takes special requests – add in the next step! Dorsett Tsuen Wan, Hong Kong accepts these cards and reserves the right to temporarily hold an amount prior to arrival. 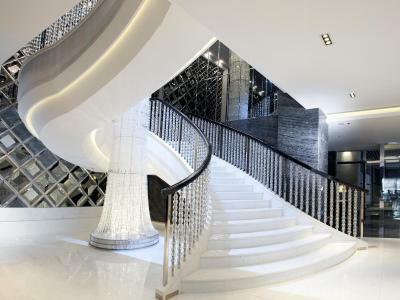 -Property offers complimentary shuttle service to/from MTR Kwai Fong, Airport Express Tsing Yi Station and Tsim Sha Tsui. -Special requests made at time of booking are all subject to availability. 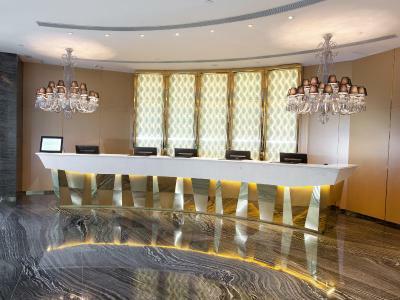 -Name of guests checking in must be the same as name in booking confirmation. -Once a booking has been made, no changes in name are allowed. Our room was a bit small but the washroom was of descent size. But then it is Hong Kong, you cant complain much. Thumbs up for the shuttle service offered. Make sure you book it couple of hours in advance or else it may be full. There is a station about 10mins walk from the hotel in case you miss the last shuttle bus back to the hotel. Other things we liked were the polite staff, the free phone, the 7 eleven right in front of the hotel and the crazy cab drivers in the area who can even beat f1 drivers. Overall, a great place to stay if you don’t mind travelling for about 25 mins to get to central. Shuttle bus services perhaps could be increased in frequency/location. 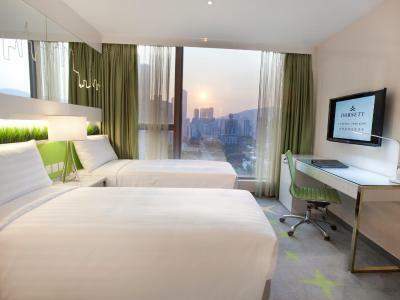 Slightly distant from the hustle and bustle of hong kong but we were aware of it at the time of booking. Staff were very friendly. Nice clean rooms. Overall an enjoyable stay. Location is in an industrial area,not in shopping and attraction areas of hongkong,no much dining options nearby....about 800 to 900 meters away only you can get an indian halal restaurent Haq,it was very tasty and good. but there was a shuttle bus from hotel to major shopping areas in tsim sha tsui,kwang fo metro station and tsing yi airport express station which was very useful to us.We went to kwangfong mtr station by shuttle bus and used mtr for all tours including disneyland.breakfast was nice.overall good experience.good kids pool with kids boats and rings was there. They need to value guests who are members or return frequently. Asked for a room we had before, told to wait 30 minutes and it turns out we were given a even smaller room. Constantly noisy in the lobby and sometimes corridor due to tourist groups. Had a woman knock on our door in the middle of the night as well. My room was on the dusty side eg the lamps and surfaces hadn’t been wiped down/dusted for a few days and when I had the do not disturb sign on the room, housekeeping still came in to make up my room when it was not needed or wanted for my last night. I was only there a short time so didn’t need towels etc. The 500 HK dollars deposit taken on arrival has still been holding on my card for quite a while after I left. I don’t feel this is needed when I paid for my stay upon arrival. 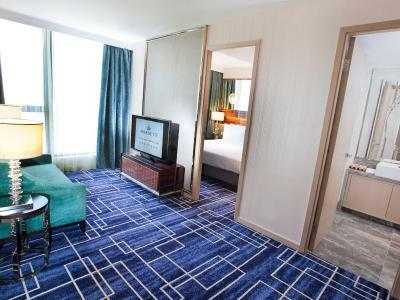 Rooms a good size and comfortable The staff I encountered were helpful and friendly Yes there isn’t much in the immediate surroundings of the hotel but the metro is not that far away and is not a problem to walk to from the hotel. Location is horrible and that's why free shuttle services. The club lounge was poorly staffed and maintain. The breakfast was bare and too consistent. Rooms are small, I had the family suite and it's big enough for two people. Room service menu is very sparse and not flexible at all. TV channels in room are bare, only two English channels. early check in was not provided . I was with kids and fmaily and had to wait for 4 hours. The receptionist staff were very rude. They were appalling in attitude. no customer service. I have stayed in many basic to 6* Hotels. these staff were by far the worst. Transport convenient once worked our. concierge staff helpful Clean room and cleaners were pleasant and always tried to communicate. 10% service charge added... this was not apparent when booking and for a hotel to essentially add a tip for service not yet rendered seemed a bit underhanded and definitely out of line with industry standards. Another money grab is to ask you if you'd like to pay in HKD or your own currency .. and they offer a really poor exchange rate on your own currency so do HKD. Pool was not heated therefore unusable in early April. Room was tired and small. Tears/wear in desk chair, beds not particularly comfy, carpet needed a clean. Staff unfriendly and unhelpful at times. Hilarious actually that after they added an automatic 10% tip for service that we were clearly not impressed about, the bell boy threw our luggage on the elevator and actually ran, yes ran, away without helping us to our room. Seems to receive most of its customers from large buses of tour groups. Shuttle to airport or Disneyland is priced outrageously at 95 HKD per person. Take the MRT/bus for under 20. A garden salad was 100 HKD. Hahahahaha! It's as though they are trying to get you to eat somewhere else so I took the hint! Nice shower. Location is good for public transit... 7 min walk to Tsuen Wan line stop and airport bus A32 stops right outside the doors.